Bow hunting is, by all means, a sport that takes skill and precision. This is not to say that hunting with a rifle doesn’t require the same, but there is something more primal and rewarding about taking your prey down with a bow. A bow requires you to be right there in on the action. With a rifle, you can literally pick your target off from two hundred or three hundred yards out. As an avid bow hunter, you probably already know that you have a lot of tools available to you. However, there is nothing out there that will quite help you like the rangefinder. That being said finding the best archery rangefinder will be no easy task and that is exactly what this guide is going to help you do. It will point out qualities that you need to look for as well as review some of the top models available on the market today. Every hunter is going to consider the price when they are shopping for hunting supplies. And, yes it is true that the more you are willing to spend, the overall better the quality will be. However, in today’s market, it is entirely possible to find a reliable cheap rangefinder that has all the essential features that you need. Rangefinders for bow hunting do not need lasers that reach to distant horizons and they don’t need a library of bullet ballistics, which makes them overall more affordable. Just sit down and consider what you are willing to spend on a rangefinder before running out and rambling through all your options. This will help narrow your search and make things easier in the long run. When you are traveling in the woods or in tight spaces, you probably want to make sure that you are carrying as little gear as possible. The more gear you are carrying the harder it is going to make your trip. The same thing can be said about the rangefinder that you choose. You don’t want a bulky rangefinder that is only going to slow you down and get in the way when you are out there in the woods. You want one that is lightweight, compact, and one that won’t hinder your travel or shooting. You most certainly want to look for a rangefinder that offers a fully armored body. This will provide the utmost protection. There is a good chance that you aren’t always going to be in ideal conditions and this is exactly where such durable bodies will come in handy. You also want to look for a rangefinder that comes with a durable carry case so that you can ensure your device will be safe during transport. When shopping for your rangefinder you want to make sure that it comes equipped with a feature known as last or far-target mode. This will come in handy when you are shooting through a screen of leaves or limbs. With this feature, the rangefinder will measure the distance to the deer or the target, not the clutter. When it comes to ease of use and dependability it will be hard to beat what the Vortex Optics Ranger has to offer. The rangefinder features a clean, illuminated display and a highly intuitive menu that is easier than ever to access and use. You will have this little device mastered in no time at all. 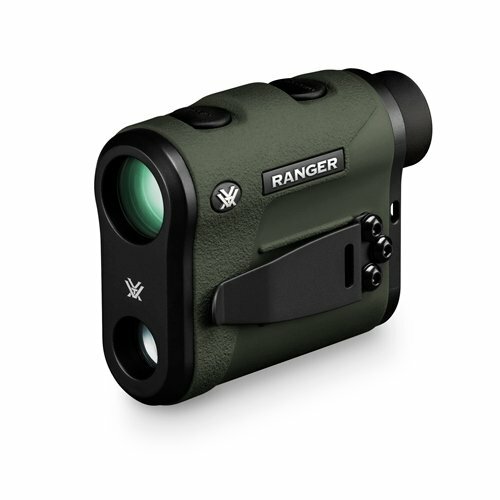 The Vortex Optics Ranger is capable of measuring distances up to a thousand yards. This is plenty of distance for any bow hunter. The scan mode is without a doubt one of the handiest features that simply cannot be overlooked. The scan feature allows you to range moving target, which can help range targets on uniform backgrounds in the HCD and LOS mode. This is a feature that will come in extremely handy when you are tracking a moving target. Once the device is powered up all you have to do is hold the measure button and scan the laser back and forth while watching the changes in the yardage number as the crosshairs move over the target. There will be a blinking S on the display when you are in the scan mode. The Vortex Optics Ranger features a handy non-slip grip so that hunters never have to worry about losing grip of the device. This will be an excellent feature to take advantage of when the weather is nastier or when you are making a quick movement. Another neat feature that cannot be overlooked is the fully multi-coated lenses. The lenses will ensure that you are provided with optimal light transmission in all lighting conditions. The Vortex Optics Ranger also features two different calculating modes. These are the HCD mode and the LOS mode. The HCD mode is the primary mode and allows for angle compensated distance. This is ideal for most hunters and shooters. However, the LOS mode really allows you the option of calculating longer distance shot and high angle shots. Simply put, in the LOS mode you are going to get an increased precision. With its compact size and all the necessary feature, the Vortex Optics Ranger certainly is a rangefinder that no bow hunter could live without. It includes three different modes that will make your shooting more accurate and help you nail down those tough angles. If you are tired of cheap rangefinders with short ranges of measurement then you need something like the TecTecTec ProWild Hunting Rangefinder. This bad boy is capable of measuring 540 yards with a continuous scan mode that will help you keep an eye on moving targets. This is something that the everyday bow hunter could use. However, that is just the start of what this device has to offer. The TecTecTec ProWild Hunting Rangefinder comes will a handy lanyard and carrying case. The carrying case will be extremely handy when you are making your way into the woods and the lanyard will be even handier when you are in place. With the device around your neck and easily accessible, you will always have quick access to it when needed. In addition to this, the device comes along with a CR2 battery, microfiber cleaning cloth, and a quick start guide. Anytime you invest your hard earned money into something, you want to make sure that you are getting quality. Even though this rangefinder is extremely affordable, you still want to make sure that you are getting what you pay for. Well, you can rest assured that is what you are getting with the TecTecTec ProWild Hunting Rangefinder and the manufacturer is even willing to back up their guarantee with a one-year warranty and a happy customer guarantee. Within the first year is something does wrong with the device or you just aren’t happy with it, you can return it and get a full refund no questions asked. This is something that a lot of manufacturers are not willing to offer. When it comes to lightweight and portability it is hard to beat the TecTecTec ProWild Hunting Rangefinder. It only measures 104×72×41 millimeters and only weight right around 185 grams. In addition to this, the device has a dust resistant, durable body that can handle the harshest of punishment. 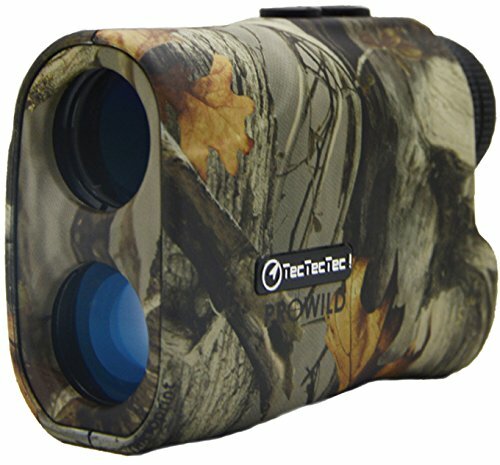 It really is easy to see why the TecTecTec ProWild Hunting Rangefinder made the list. It includes everything the bow hunter needs. Searching for an affordable rangefinder in today’s market that is both affordable and includes all the necessary features is by no means an easy task. Well, if this is what you are looking for then you shouldn’t look any further than the Wosports Hunting Rangefinder. This handy little device will not only accurately calculate those angles and distances that you need to get a more accurate shot, but it will look good while doing so. The handy camouflage body will keep you hidden while you measure your distance or calculating your angle. The manufacturers of this product are so confident that you are going to be satisfied that they are willing to offer a happy customers guarantee. Within the first year of use if you are not satisfied with the product just simply contact the manufacturer and they will give you a refund in full. What’s even more impressive is that the manufacturer has a lifetime customer support staff always standing by heading to assist or answer any questions that you might have. There is nothing harder than tracking a target. Maybe you hit the kill shot, but the deer just didn’t die right away. Maybe you fatally wounded the deer, but it still has the willpower to make the last run for it. 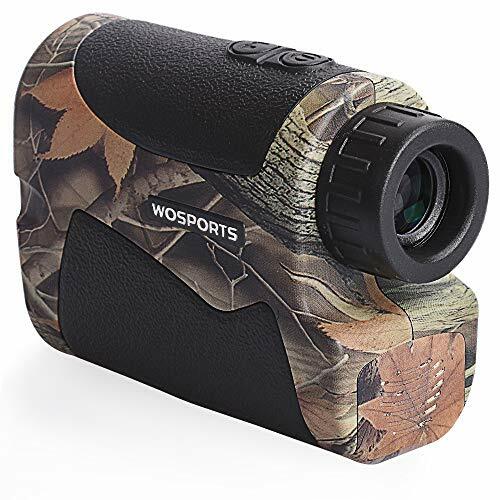 Whatever the situation is tracking a moving target will be easier than ever with the Wosports Hunting Rangefinder. And, this is all thanks to the scan mode. The scan mode allows you to read the data of the LCD as you move the rangefinder back and forth. With the ability to accurately track moving targets, you will be able to get a more precise shot. Sometimes the bow hunter needs to calculate angles and distances from up close. Sometimes the need to do it from a distance. With the Wosports Hunting Rangefinder, you will be able to do both. The rangefinder offers measurements from 5 yards to 650 yards. Another good thing worth mentioning is that the rangefinder can lock at 150 yards. If used on the M2 Mode the device can lock targets at 150 yards. It is hard to argue that this handy little device won’t come in handy for any average or professional bow hunter. There is no hunter out there that hasn’t heard of the Nikon name. This is especially true if you are a rifle hunter. Over the years the company has been known for creating a plethora of sights and scopes. Throughout the years they have grown quite adept at producing quality products. Well, they have now developed a handy little rangefinder that can help the bow hunter. When you see everything that the Nikon 16224 Arrow ID Rangefinder has to offer you will see that the Nikon standards are more present than ever. When it comes right down to it the Nikon 16224 Arrow ID Rangefinder is an impressive device that offers a range of essential features. However, the most impressive thing about the rangefinder is the advanced incline/decline technology. This technology will come in extremely handy when you are trying to calculate those pesky angles. The technology provides the horizontal distance to the target even when you are ranging from the incline or decline position. This will come in handy when you are hunting from a tree stand. Another feature that must be mentioned is the tru-target technology. This technology allows the hunter to choose between two different ranging modes depending on the situation. This is something that will come in extremely handy when you are trying to get the distance or angle on a target that is located behind tall grass or brush. The best thing about this technology is that accessing it is easier and quicker than ever. All you have to do is hold down both buttons for two seconds and you will automatically be switched to this new mode. It really doesn’t get much easier than that. One area where the Nikon 16224 Arrow ID Rangefinder excels is the eye relief. The Nikon 16224 Arrow ID Rangefinder offers an incredibly long eye relief at 20.3 millimeters, which will make viewing and ranging targets faster and easier than ever. The Nikon 16224 Arrow ID Rangefinder really was designed to make your life easier. And, with its lightweight and compact design that is exactly what it does. From a simple single button control to the large 18mm ocular the rangefinder is extremely easy to use. It is also extremely compact and lightweight. It is easy to see that the Nikon 16224 Arrow ID Rangefinder lives up to everything that the Nikon name stands for. Bow hunting takes a lot of patience and skill. This is especially true when it comes to estimating distances and calculating angles. 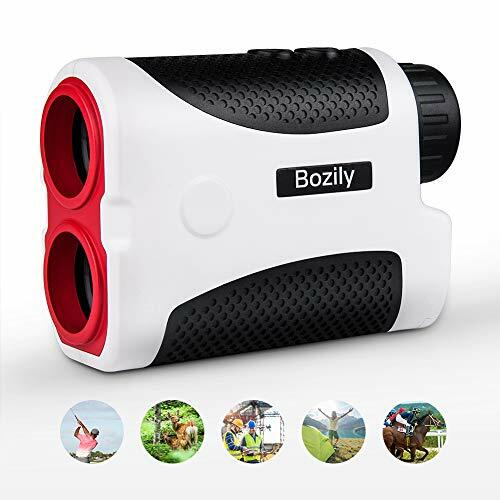 Well, if you want to take your game to the next level and no for a fact that you are making the right calculations, you need to take advantage of the Bozily Rangefinder. 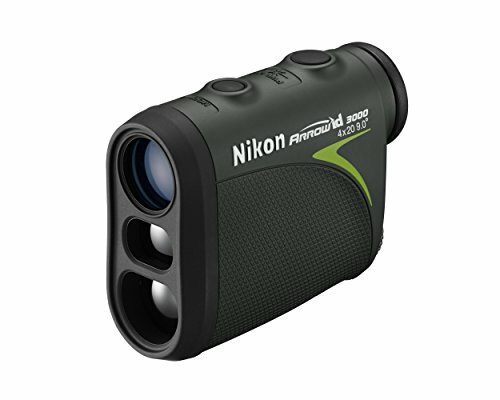 This certainly is an impressive rangefinder that is packed with numerous features. The first thing that you need to know about the rangefinder is that it is capable of measuring up to 900 maximum yards. And, this is just the start of what this impressive little device has to offer. The Bozily Rangefinder doesn’t offer just one scan mode but it offers 4 scan modes. The general mode is designed for space distance and angle measurements while the second mode will show you the angle and slope that is between you are your chosen target. However, the third mode is for vertical and horizontal distance measurements. The last mode is speed. The rangefinder is capable of measuring speeds of 20 to 300KM/H. This is probably a feature that won’t come in handy for the bowhunter, but it is equally impressive in its own right. When you are out in the woods you never know what you are going to encounter. You also never know how the weather is going to play out. Sure, you can watch all the weather reports that you want, but like many hunters, you probably know that things can change quickly. The Bozily Rangefinder is extremely durable with a water-resistant body so you never have to worry about what type of weather conditions you find yourself in. The Bozily Rangefinder will hold up in the toughest of weather conditions. Sometimes you might need to sight targets that are farther out and sometimes you might need to sight targets that are close up. Well, when you invest in the Bozily Rangefinder, you will have the ability to do both thanks to the 6X magnification. This magnification will easily allow you to sight in targets that are both close and far out. The Bozily Rangefinder certainly is a must-have for any boy hunter looking to enhance their skills.